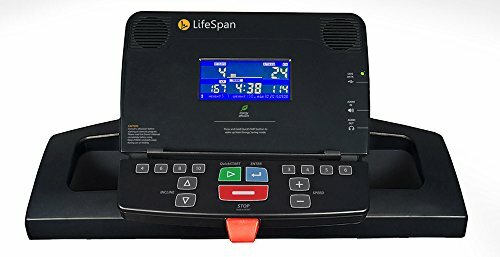 The LifeSpan TR1200i treadmill lets you command each aspect of your fitness, all at a price that can’t be beat. The 20" by 56" running surface is perfect for walking, jogging, or running, and is supported by 6 compression shock absorbers to provide safe cushioning for your knees, back, and joints. To help track your workout, the treadmill automatically records your exercise data to a USB storage device for upload to your Club account. And when you’re done? Simply fold up the treadmill with EZfold for unobtrusive, compact storage. Backed with a lifetime frame and motor warranty, a three-year warranty, and a one-year labor warranty.